Hey, my new book is out. Four years in the making, this is a look at cheddar cheese. Why cheddar? Because there is no way to understand cheese made in the USA without understanding cheddar, its affect on all American-made cheese, and cheddar’s relation to the food system as a whole. Don’t get me wrong though. It’s a fun read too. Buy it here! Or buy it wherever you buy your books. It’s all good. The San Francisco Chronicle compared it to Sarah Vowell (which to me is one of the highest compliments possible). 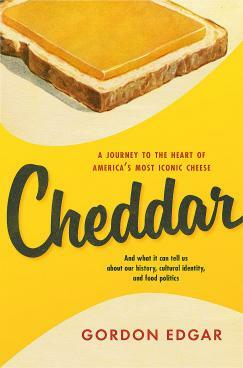 “One of the oldest, most ubiquitous, and beloved cheeses in the world, the history of cheddar is a fascinating one. Over the years it has been transformed, from a painstakingly handmade wheel to a rindless, mass-produced block, to a liquefied and emulsified plastic mass untouched by human hands. The Henry Fordism of cheddar production in many ways anticipated the advent of industrial agriculture. They don’t call it “American Cheese” for nothing. More than that, though, cheddar actually holds a key to understanding not only issues surrounding food politics, but also some of the ways we think of our cultural identity. Cheddar, and its offshoots, has something to tell us about this country: the way people rally to certain cheddars but not others; the way they extol or denounce the way others eat it; the role of the commodification of a once-artisan cheese and the effect that has on rural communities. The fact that cheddar is so common that it is often taken for granted means that examining it can lead us to the discovery of usually unspoken truths. — Chapter 4. Oh Geez, What is Cheddar Anyway? — Chapter 12. Cheddar-making or Myth-making?